1. Boil the pasta in water for 8 minutes then drain. 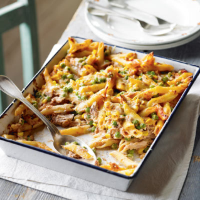 Heat the cheese sauce in the same pan with the sweetcorn, peas, tuna and tomato purée. 2. Stir in the pasta, season and transfer to an ovenproof dish. 3. Sprinkle with cheese and place under a grill for 3 minutes until golden.